On the surface, sixteen-year-old Lesley Holloway is just another bright new student at Hawthorn Hill, a posh all-girls' prep school north of London. Little do her classmates know that she recently ran away from home, where her father had spent years sexually abusing her. Nor does anyone know that she's secretly cutting herself as a coping mechanism...until the day she goes too far and ends up in the hospital. Lesley spends the next two years in and out of psychiatric facilities, where she overcomes her traumatic memories and finds the support of a surrogate family. Eventually completing university and earning her degree, she is a social services success story––until she becomes unexpectedly pregnant in her early twenties. Despite the overwhelming odds she has overcome, the same team that saved her as an adolescent will now question whether Lesley is fit to be a mother. And so she embarks upon her biggest battle yet: the fight for her unborn daughter. Etched on Me is a completely original and utterly compelling story about the life of Lesley Holloway and the terrible and also wonderful things that happen to her in the wake of the abuse by her father. Things in the novel just seemed to spiral out of control- beginning with her removal from the family home and then following later with her fight to keep her own child. I started reading this book one evening (as I like to read a bit before bed) and I must confess that I was unable to put it down until I literally could not keep my eyes open any longer. So many heartbreaking and absolutely awful things happen to Lesley and the story unfolds in such a way that you just cannot help but feel for her and want to protect her. Many times I felt so helpless and I could only imagine what it would feel like to be in her shoes. 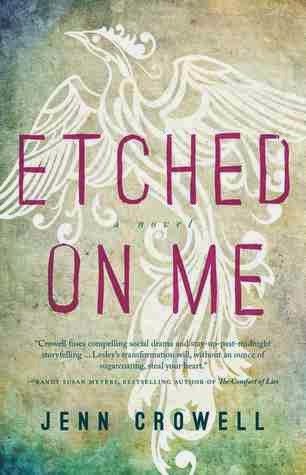 Etched on Me touched on so many very difficult topics including abuse and mental illness, among others. It was therefore not a book that was easy to read but was definitely an extremely powerful story that I will not soon forget. Thank you to Atria Books for our review copy. All opinions are our own.